This category contains most of the information pages for Thinking Matters, such as contributor profiles, the about page, and so on. However, two obvious things need to be noted: firstly, an explanation which fails to include a necessary entity is too simple, and therefore is necessarily false. Imagine the dead man was 90 years old and had a heart condition. Ordinarily, natural causes would be the simplest and most likely cause of death. But there is evidence of blunt trauma; so if the detective posits a natural heart attack as the explanation for man’s death, his explanation is obviously too simple—and thus must be wrong. A blunt object is a necessary entity in the explanation. So an over-simple theory must be wrong, but an “over”-complex theory might be right. There are plenty of good arguments to show that a non-theistic explanation of reality is over-simple in such a way that it must be false. I hope to discuss more of these in the Philosophy section of Thinking Matters Talk as time goes on. What is the purpose of thinking matters? I know the answer that is here, but what I want to understand is what constitutes success? What is the purpose of “examin[ing] and explain[ing] the defense of the Christian faith”? I have my ideas but want to know what others think. 1. The purpose of Thinking Matters is primarily to provide a “common area” for New Zealand apologists. Our aim is to give some focus to the various individuals and groups in New Zealand who would otherwise be doing their own thing without much awareness of the efforts of others. In that vein, I think we’ve been fairly successful already; although admittedly we need a new injection of enthusiasm to galvanize some further action. 2. Because of (1), the purpose of apologetics is not something that Thinking Matters, as an organization, has taken a specific position on. I think it has, so far, been sufficient simply that we all agree apologetics is necessary and important. The views of the individuals who contribute to TM may differ on the precise purpose of apologetics—some widely. Similarly, our views on apologetics methodology may differ. As you know, I’m strongly presuppositional. But to be a well-rounded apologetics organization, I think we also need some classical and evidential apologists filling out the mix. 3. For my own part, I believe that apologetics is an important pre-evangelical, and post-evangelical discipline. (i) In terms of pre-evangelism, apologetics is often necessary to remove the epistemic defeaters to Christian belief. Since faith is rational, we cannot expect it to obtain in situations which would render it irrational; such as when people hold strong beliefs which contradict that faith. This is especially important given that we aren’t living in a Christian society any more, but a post-Christian one. People are increasingly skeptical of Christian faith-claims because they increasingly (a) fail to understand them, and (b) are influenced by scientism/modernism (I don’t believe post-modernism has actually had the societal effect some people think it has had). Apologetics in this context isn’t only or even perhaps primarily about laying the groundwork for evangelism itself; as you commented to me privately, the rational defense of the faith is a necessary condition for “ensuring ongoing freedom to be Christian in an increasingly hostile, left brained, rational and intellectual world.” Christianity needs champions in the academic arena to show that our faith is intellectually justified and defensible. This is very important in the universities in particular, since they are the breeding grounds for the upcoming movers and shakers in society—and they are largely secular. (ii) In terms of post-evangelism, apologetics is extremely important for dealing with doubts, and for growing in faith. Again, faith is rational—so where defeaters exist for it, cognitive dissonance occurs. This can be really damaging; especially for people who are converted through more emotional and less intellectual means. A lot of people have powerful conversion experiences, but then later when they start to really think about their faith, and perhaps share it with others, they encounter a lot of objections and doubts. This is especially true online, where there are lots of New Atheists who are highly hostile to Christianity, and have prima facie reasonable objections to faith, backed up by a lot of attitude which replaces the work of actual reasoning and underwrites the appearance of a righteously indignant worldview which opposes Christianity because it is so irrational. Without apologetics, this can be fatal to faith. Christians need to know that (a) doubts are not sinful; and (b) that answers do exist. And currently, I don’t believe that most pastors in New Zealand are actually equipped to provide the sorts of answers that some Christians may need. A lot of questions are not really considered seriously and addressed, so much as dismissed and swept under the rug (particularly in less conservative churches; I think Pentecostalism has a lot to answer for with its generally anti-intellectual, emotion-based faith). Note that none of this is to say that faith is only rational. Thinking Matters’ declaration of belief is thoroughly Reformed in its view (albeit implied) that faith is an actual ontological change caused by the indwelling of the Holy Spirit in the new believer. However, it’s important to still affirm that faith is rational; and that because it is rational, doubts will occur where certain presuppositions or beliefs conflict with it. Apologetics is a means God uses to defeat unbelief, and to then preserve the saints in faith. That’s my view, at least. Other contributors are welcome to chip in with their own. Mathematician and philosopher William Dembski presents five questions evolutionists would rather dodge in this excellent quick resource for dealing with evolutionary theory. This includes (i) the fossil record, (ii) natural selection, (iii) detecting design, (iv) molecular machines, and (v) testability. A senior cleric of the Church of England wants his church to apologize to Charles Darwin in time for the observance of the 200th anniversary of Darwin’s birth next year. The Rev. Dr. Malcolm Brown, Director of Mission and Public Affairs for the church, made his case in an article entitled, “Good Religion Needs Good Science,” published in a special new section of the Church of England’s official Web site. Apologize to Charles Darwin? On today’s program, Dr. Mohler says the Church of England may well need to apologize, but not to Charles Darwin. If anything, the church needs to apologize for its rightful embarrassment in considering an apology to Darwin. http://thinkingmatters.org.nz/wp-content/uploads/2018/12/Thinking-Matters-Logo-MEDIUM-BLACK-TRANPARENT-1030x278.png 0 0 Rob http://thinkingmatters.org.nz/wp-content/uploads/2018/12/Thinking-Matters-Logo-MEDIUM-BLACK-TRANPARENT-1030x278.png Rob2008-09-21 04:46:312017-10-10 19:16:43Apologize to Charles Darwin? In the comment stream of a recent post by Ken Perrott, ‘A new science-bashing campaign?’, some discussion has been taking place about whether intelligent design (ID) can be considered scientific. Typically, secular scientists are vocal in their assertion that ID is a philosophical idea, and not a scientific one. It’s inappropriate to treat ID as if it were a scientific theory, or as if there is real evidence to support it, they say. And there is the vocal minority of ID supporters who push back and say the opposite. In the comments on Ken’s article, the editor of Christian News New Zealand cited an article on Opposing Views by Jay W Richards, titled ‘Is Intelligent Design Science?’. I encourage you to read this article; it argues simply, yet I think persuasively, that it is not unreasonable to consider ID science—and that wherever you stand on the issue, you’d be naive to dismiss ID as unscientific by trying to define science in such a way as to preclude it. What Jay Richards and others need to realise is that ‘ID’ is a philosophical inference which attempts to be scientifically informed. It starts with an inference, and then tries to find/match it with science – or (re)interpret science to try and match it up with the inference. The inference is not scientific, but philosophical. Now, I don’t think Dale is opposing ID per se; rather, he is expressing his view that it’s a philosophical, rather than scientific position. As a Christian, I’m sure he does believe in ID; and as a Christian, certainly ID is a philosophical position. But does this preclude it from being scientific as well? I don’t believe it does. Firstly, ID does not necessarily start with the inference of design, and then look for data in support of it. In fact, I think manifestly the fact that ID is not a specifically religious view demonstrates that it is quite possible and reasonable for it to be an a postiori rather than an a priori inference. Certainly for the Christian it must be treated as a priori: we come to the study of science with the presupposition that the universe was designed and created by God. But ID is not confined to Christianity, nor to religion at all. ID is simply the thesis that the universe, or some part thereof, was designed. A non-religious scientist could come to this conclusion quite reasonably by studying empirical data, and deciding that the facts at his disposal are best explained by a designer. Is this an unscientific conclusion? Is it merely philosophical? This question raises another in turn: What is the difference between a “philosophical” as opposed to a “scientific” inference? For my own part, I’m not sure I see a clear distinction between them. Scientific inferences have two defining characteristics that I can see: (i) they start from empirical data; (ii) they are by nature abductive (and/or inductive; but abduction really is what defines them). Abduction, however, is itself a philosophical process; so I don’t see how we can deny that scientific inference itself is intrinsically philosophical. It is simply a kind of philosophical inference. All inference is philosophical in one way or another; and abduction is arguably more influenced by philosophical concerns than straightforward deduction. But if scientific inference is characterized by these two principal factors, then how is ID not a scientific inference? Empiricism and abduction seem to describe the inference of ID just as well as any uncontroversial scientific inference which comes to mind. Typically, I’d expect a scientist to say that I’ve omitted a third factor: scientific inferences need to be falsifiable. But there are two obvious objections to this: (a) falsifiability is a relatively modern notion in the history of science, and as such can’t be used to define science qua science. But more importantly, (b) it’s transparently evident that not all scientific inferences—indeed, perhaps not even most scientific inferences—are falsifiable. It’s not inferences which scientists generally require to be falsifiable, but theories. But even then, a theory is just the conclusion of a number of inferences (ie, it is itself an inference), many of which might not be themselves falsifiable; so the demand of falsifiability seems rather arbitrary. Whether or not ID is true, and whether or not anyone can or has come up with falsifiable hypotheses about it, it does seem to me that Jay Richards is correct in his evaluation that it is not intrinsically unscientific. As he explains, we can’t validly keyhole science to fit certain preconceived philosophical notions about the world. In fact, the attempt to define ID out of science is openly prejudiced and hypocritical, being the attempt to exclude philosophical views of the world from science, on the basis of a philosophical view of the world. The definition of science really is not as fixed, narrow, or agreed upon as anti-ID scientists and philosophers would like to say it is. http://thinkingmatters.org.nz/wp-content/uploads/2018/12/Thinking-Matters-Logo-MEDIUM-BLACK-TRANPARENT-1030x278.png 0 0 Bnonn http://thinkingmatters.org.nz/wp-content/uploads/2018/12/Thinking-Matters-Logo-MEDIUM-BLACK-TRANPARENT-1030x278.png Bnonn2008-09-11 23:24:382017-10-10 19:39:16Is intelligent design scientific? The event was held in Usher Hall, one of Edinburgh’s largest indoor venues and the organisers estimated that there were around 1,400 people attending the debate. The motion to be discussed was: “The New Europe Should Prefer the New Atheism” and the debate was between Christopher Hitchens (Social commentator and author of God is Not Great: How Religion Poisons Everything) and John Lennox (Professor of Mathematics at Oxford University and author of God’s Undertaker: Has Science Buried God?). An initial show of hands was taken at the start of the debate, so that they were able to see what standpoint members of the audience already held in order to compare what change there had been as a result of the debate. This vote showed that the audience was quite evenly split (with perhaps a very slight advantage to those opposing the motion) and that there was a good proportion (perhaps 20%) of people who were undecided. The format of the debate was 15 minutes for opening statements (with Hitchens going first) followed by 5 minutes each for rebuttals. There was then 30 minutes of questions from the floor followed by a 5 minute concluding remark from each of the speakers (With Lennox going first this time). The debate was moderated expertly by James Naughtie, a well-known radio 4 presenter. The final result was that Lennox won the debate (the motion was not passed) with a small, but discernible shift, in favour of his viewpoint from the previously undecided camp. To his credit, Hitchens conceded that there were more in favour of John, even though the moderator was initially unsure. 1. The threat of Islam. He focused upon the demanding of special rights for Islam backed up by violence and used the example of the reaction to the Danish cartoons as showing that freedom of speech was being eroded through fear. 2. The revival of Russian imperialism, founded upon the Christian orthodox faith. He spoke of the conflict in Georgia, as well as the recent flexing of muscles against Poland (for agreeing to the missile defence shield) and the Ukraine (for being more pro-western). 3. The non-scientific ideas being propagated in some schools by Christian fundamentalist teaching. “faiths” rather than of the “faith”). He concluded by saying secularism is at the core of our constitution and that he hoped that the fact back started here. 1. He too was appalled by extremists, but said that saying “religion poisons everything” is the same as saying “science poisons everything” – it is nonsensical. You can’t blame science for giving you pollution or napalm and therefore you have to distinguish use from abuse. 2. That Jesus spoke of rendering unto Caesar what was Caesar’s and that you have to distinguish between the abuses of Christendom and the teachings of Christ. 3. That Christianity provided the educational establishments and the freedoms upon which new Europe is based, yet the atheist’s want to get rid of it (they are forgetting their history and they can’t have it both ways). 4. That atheists say the world would be better without religion, but the world would have been better without the communist regimes (and that Marxism is underpinned by atheism). 5. That science cannot explain everything (e.g. why are we here?) and that the discipline itself was only possible through the belief in a creator/law giving. He said that atheists have “faith” in the rational intelligibility of the universe, but their worldview gives no basis for believing this. He said it was a false dichotomy to speak of science or faith. 6. That if you do not believe in absolute morality and you think that we evolved from mindless processes then you cannot trust your own rationality (as rationality does not come from irrationality). 7. Likewise you have no grounds for saying something is right or wrong as you are merely “dancing” to your DNA (quoting Dawkins). DNA serves evolutionary pressures not the truth (quoting atheist John Gray). Therefore concepts of good and evil, right or wrong evaporate, as do any notions of justice. If you believe in a creator then you have grounds for saying people have innate morality as they are made in God’s image. So John concluded by opposing the motion and pointing out that the atheists couldn’t even use the word “should” anyhow (as they are unable to establish the grounds upon which to make a moral statement). 6. That religion is totalitarian and that this round-the-clock supervision included condemning you for thought-crimes and continuing to supervise even after you are dead. 10. That there has been no atheistic regime based upon the teachings of Hume, Spinoza, Jefferson, Bertrand-Russell and others and if there were it wouldn’t be a violent one. 1. Jesus was not referring to a physical sword in that passage and his views on violence were demonstrated by the fact that he even resisted violence at his own arrest. 3. That the debate was not about certain beliefs about science, but it is about whole worldviews. This is why Francis Collins and Jim Watson (both of whom headed up the human genome project) have differing views. There are scientists on both sides of this debate and therefore it is not about God or science – it is about worldviews. 4. Your view of justice depends on which side of the fence you are on (i.e. the oppressed crave justice). He used the example of marriage to respond to Hitchens’ portrayal of a divine supervisor regulating your behaviour. He said that your wife is someone who watches over you and who regulates your behaviour, yet marriage is not seen as bad thing for that reason, because it is someone who loves you, etc. The question and answer session was quite mixed with various people (from both sides) making statements which were not questions (e.g. an elderly scot tried to evangelise to Hitchens in a long-winded manner and another person accused Lennox of consigning her to hell because of her beliefs – John responded to this by saying that we are all given a freedom to choose and that God does not want to consign anyone to hell). One person highlighted the fact that Hitchens had commended secularism rather than new atheism to the audience. He asked how he could he say that the new atheism would not lead to the ramification of old atheism (e.g. the regimes of Stalin, etc). Hitchens responded to this by saying fascism was another name for the Catholic far right. Someone asked about miracles and John responded by affirming the existence of a creator who had shown himself historically and that he was quite capable of feeding events into the laws of nature. He pointed out that although atheists like to attack the likelihood of the resurrection, he pointed out that some atheists prefer to propagate the “multiverse” theory, where there are supposedly many different parallel universes in which, for example, you and I don’t exist in some or where one of us has a green moustache in another. John pointed out that if you are willing to believe that, then you are willing to believe anything. Another person asked about whether “Intelligent design” was associated with a “lunatic” fringe. John replied “not necessarily”, which prompted some gasps amongst the audience, but he went on to explain that the words “intelligent design” and “creationism” had been hijacked by some and caricatured by others, when in fact, the idea that there is a creator and that there is intelligence behind the design is a very credible scientific thesis (i.e. it is not one to be dismissed out of hand). Another person asked whether in fact Christianity had been shaped by society (the prevailing zeitgeist) rather than the other way around (mentioning than Lucretius and Epicurus had not been influenced by Christianity). John responded by pointing out that Greece was not a wonderful utopian society when these ideas were being disseminated and it was Christianity that revolutionised Europe. A number of people touched upon historical violence in the name of Christianity, which John rebuffed by pointing out that these instances were people disobeying the explicit teachings of Christ. Another person asserted that people were just products of their own religious upbringing and that religions contradicted one another so most of them must be wrong. John denied that people blindly followed their upbringing and he agreed that do of course religions contradict one another and that they couldn’t all be right. John started by pointing out the difference between the “soft” atheists (Dawkins, Hitchens, etc) and the “hard” atheists (Sartre, Camus, etc). Whereas the soft atheists cling to the things that they cherish in society (morality, justice), the hard atheists were under no illusion as to where their views ultimately led (to the destruction of all values, morality and hope). 1. He challenged the new atheists to justify how they were able to say humans were more significant than just slime, when their views give no basis for this (e.g. Peter Singer saying a human baby has no more value than a piglet). 2. He also reiterated the importance on being able to debate these issues in the public sphere, but that he wasn’t sure that the atheists shared this notion of freedom of expression (given Sam Harris saying that there are some circumstances where you maybe justified in killing someone because of their beliefs). 3. He questioned whether the new atheists should be allowed to decide for everyone what was right and he pointed out that atheism nurtures a need for meaning (and therefore religion). 4. He said the atheists lose their pretension of intellectual credibility when they lump all religion in together. 5. He then pointed out that Christianity played a major role in the creation of the new Europe in the first place (e.g. in helping to overthrow the old atheism in communist East Germany) and he finished by quoting the recently deceased literary nobel prize winner Solzhenitsyn: “if I were called upon to identify briefly the principal trait of the entire twentieth century, here too, I would be unable to find anything more precise and pithy than to repeat once again: Men have forgotten God”. 6. John said he wished they hadn’t forgotten God and finished by saying Christianity helped pull the wall down in Europe, do we really want to build another one? Christopher Hitchens responded by asking how we know all this and where John was getting all of his information from. 1. He said he didn’t need to call upon an invisible means of support from a totalitarian God who provides divine assurance. 2. He criticised the idea of “vicarious redemption” and said that you shouldn’t want someone else paying your debts for you (as he said it cancels your responsibility). 3. He said that this offer is then backed up by a threat of hell. 4. He asked how we even know about hell when all the religions contradict each other and therefore by definition that most religious thinkers throughout history must have been wrong (assuming that one religion is right). He says this causes moral chaos (as people can’t agree). 5. Finally he concluded with a challenge to name a moral action done by a religious person that couldn’t be done by a non-religious person and then said to think of an evil action done in the name of religion. [He meant to finish by saying that would not be done by a non-religious person, but he didn’t say this, which meant his final point wasn’t quite as he had intended). The debate was an interesting clash of styles, with Hitchens favouring less points, but made very forcefully with humour and quips to strengthen his argument. He did make a couple of isolated “low blows” by interrupting one of Lennox’s points during the rebuttal (by dismissing it as a weak point), as well as saying “he didn’t need 5 minutes to dispel the resurrection” without then attempting to do so. Lennox by contrast had a huge number of points and quotes (many from atheists) and therefore if you transcribed the debate he would have been the overwhelming victor. However, because of Hitchens’ strong oratory skills, he was able to reduce the gap, in spite of Lennox’s great charisma. It seemed that Hitchens going first turned out to be fortuitous because his opening statement focused upon politics and religion and it included much that Lennox could agree with. Lennox was then able to attack the ideas underpinning new atheism, which left Hitchens with only the rebuttal and concluding remarks to reply in kind. However, the format did at least allow Hicthens to have the last say, when it would have been nice to have been able to respond to some of his final comments, particularly those concerning the cross. The other interesting thing to note was the palpable level of aggression and derision from atheists in the audience towards Christianity (e.g. people were vigorously nodding and muttering in agreement with Hitchens’ points, irrespective of whether it was a stronger or weaker point that was made). I found the level of this to be quite surprising and it seemed to me that this refusal to concede any ground to the opposition greatly weakened their case, as this dismissive attitude (possibly based on a perceived intellectual superiority) suggested that they weren’t prepared to engage with the evidence at hand. This also highlighted how important it is for Christian to be different to this (as John was) by being fair with the evidence at hand, in order to properly engage with those who disagree with us (rather than being immediately dismissive). Likewise, it also demonstrated the important challenge of attempting to communicate the gospel effectively and positively to those who – for whatever reason – already have very negative picture of what the Christianfaith is all about. For those interested, the DVD of the debate can be pre-ordered from the Fixed-Point Foundation website. Things have been happening in the New Zealand apologetics community. A couple of weeks ago Jason and I met with the editor of Christian News, and also with some members of the Manawatu Christian Apologetics Society. We spent a lot of time talking about the state of apologetics in New Zealand, and the various groups and individuals around the country. 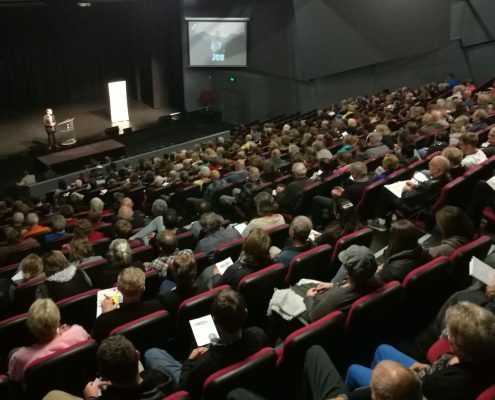 We specifically focused on our concerns over the feeble and fragmented nature of, and lack of communication within, the New Zealand apologetics community. To cut a long story fairly short, we all agreed that, if we could draw as many people as possible under a single banner, it would go a long way toward empowering the apologetics community. The Thinking Matters ministry presents itself as an obvious locus for connecting people in this way. Subsequently, Christian News and the Manawatu Christian Apologetics Society will be joining us under the Thinking Matters banner. They will, like Thinking Matters Tauranga, remain autonomous in their functioning; but we’ll share the same name and resources. This means that Thinking Matters will subsume and expand on the role of the New Zealand Christian Apologetics Society. Since Christian News is being conglomerated into the Thinking Matters domain (thinkingmatters.org.nz), but remaining separate in terms of operation, we’re having to be fairly creative from a technical perspective. Christian News will still be accessible from http://christiannews.co.nz, but will change its primary address to http://news.thinkingmatters.org.nz. News will be aggregated on the main Thinking Matters site, here. This means that a lot of cosmetic changes must take place as well. Fortunately, both sites run WordPress, so we’ll be adopting a new, commercial WordPress theme so as to ensure that we have a consistent image, and also to reduce the amount of work required of myself and other Thinking Matters contributors in developing and maintaining the various sites. We made this decision because we don’t feel that the forums contribute positively to the purpose of Thinking Matters. While we do want discussion to take place, it seems much more sensible to have it take place here on the main site, in the comment streams of the various articles which are posted. This is a more dynamic and accessible way of having discussions than the monolithic forum structure allows. We want to ensure that this discussion contrasts with and complements Thinking Matters News, so we’ll be rebranding the blog to take on the “Engage” moniker, thus specifically encouraging the view that articles are springboards for discussion. The journal is still a strong part of our purpose for Thinking Matters, and our first issue is in fact ready to go. However, to accommodate the changes we’re making to the website, we felt it better to delay publication until things are properly re-organized. The journal will be published at journal.thinkingmatters.org.nz as soon as everything has settled down. The upshot of all this is that we’re going to be under construction for a while. Please bear with us as we go through this transition. We’re confident that it will be for the best. Back in the 1940s and ’50s, many philosophers believed that talk about God, since it is not verifiable by the five senses, is meaningless—actual nonsense. This verificationism finally collapsed, in part because philosophers realized that verificationism itself could not be verified! The collapse of verificationism was the most important philosophical event of the 20th century. Its downfall meant that philosophers were free once again to tackle traditional problems of philosophy that verificationism had suppressed. Accompanying this resurgence of interest in traditional philosophical questions came something altogether unanticipated: a renaissance of Christian philosophy. Whispering to his coreligionists in Christianity Today, to his subculture, Craig does not do justice to what the revolution is up against. His bygone atheism is a straw man. A quick look at the religion section in any major chain bookstore shows a whole crop of habitable sequels to the New Atheists’ opening salvos. There are atheism readers, atheist spiritualities, and all the chicken soup an atheist soul could need. Rather than lacking “intellectual muscle,” as Craig puts it, the online community formed around Edge.org shows that some of today’s most dynamic scientific minds all but assume atheism. …Mr. Schneider misunderstands me when he says that my “bygone atheism” is a straw man. What I characterized as “bygone” was not atheism, but the past generation dominated by the sort of scientism and verificationism that still lingers in the so-called New Atheism. The fact that such popularistic drivel continues to pour forth from the presses and to fill our bookstores at the mall does nothing to refute my claim that the New Atheism is in general predicated upon epistemological assumptions that are no longer viable. You can read the rest of the reply, including Craig’s appraisal of Schneider’s interaction with some of the arguments of natural theology, on the Society’s website here. An old interview but worth dusting off, if only to see how not to do apologetics. Stephen Colbert, on his show The Colbert Report, engages the agnostic Biblical scholar, Bart Ehrman. Colbert replicates the fundamentalist timbre, retreading the familiar rhetoric and arguments that many Christians can often fall back on too easily. This is Colbert, of course, at his inimitable best – imitating a subculture for deliberate comedic effect. Ehrman however, is not trying to be funny, he actually wants us to take him seriously. The book he is promoting in the clip went on to become a New York Times bestseller. Misquoting Jesus narrates Ehrman’s own intellectual recourse from Christianity, after encountering problems in the Gospels during his PhD program. In the wake of the Jesus Seminar and the Dan Brown frenzy, Ehrman’s conclusions have captured the attention of the media and popular consciousness. It’s no wonder; questions about the trustworthiness of the Gospels assail at the heart of the Christian faith. If the New Testament documents are inaccurate and an unreliable guide of the life, death and resurrection of Jesus – our Christian footing is infirm, our hope misplaced. Colbert aside, there have been compelling scholarly responses to Ehrman. While the Biblical self-witness must not be robbed of its place and power in determining its own authority, Christians can confidently argue for the historical reliability of the New Testament documents. Many critics have shown that Ehrman handles the data in a way that exaggerates the significance of the discrepancies in the textual streams. At the Greer-Heard Forum with Dan Wallace in April this year, Ehrman tellingly admitted that no essential belief of the New Testament was compromised by the textual variants. Yet a more controversial side of Ehrman seems to persist and, along with the Jesus Seminar, portray a skewed, idiosyncratic representation of the scholarly world. Such a segment stands in contrast to what has been called the third quest for the historical Jesus. A movement that is substantially more optimistic about reconciling the Jesus of history with the Jesus of the New Testament. For those interested in a primer on Textual Criticism Paul D. Wegner’s A Student’s Guide to Textual Criticism of the Bibe is a good start. To keep up with the contemporary discussion from the evangelical perspective, the Evangelical Textual Criticism Blog has a fine grouping of contributing scholars.